After a week when the Supreme Court’s words were the focus across the nation, it’s what the judges didn’t say yesterday that will have an impact on elections for the foreseeable future. As part of the Monday orders list – one of the last before the Court adjourns for the summer – the Court denied certiorari (refused to consider) Kobach v. U.S. Election Assistance Commission, an appeal from a Tenth Circuit decision late last year blocking proof-of-citizenship for voters using the federal registration form in the State of Kansas. That denial lets the lower court invalidation of the law stand. People in Kansas can still register to vote in federal elections without showing proof of citizenship, the U.S. Supreme Court ruled Monday. But whether those people will be allowed to vote in state and local elections remains an open question. The court on Monday refused to hear Kansas Secretary of State Kobach’s appeal in a case in which he asked that the U.S. Election Assistance Commission provide a federal voter registration form that comports with state law, which requires voters to show proof of citizenship. Last year, the 10th U.S. Circuit Court of Appeals ruled against Kobach, saying the EAC did not have to provide a revised federal form for use in Kansas. The Supreme Court’s decision Monday not to hear Kobach’s appeal means the 10th Circuit’s ruling will stand. Meanwhile, a separate lawsuit is pending in state court that challenges Kobach’s policy of not allowing people who registered using the federal form to vote in state and local races. That case, which is pending before Shawnee County District Judge Frank Theis, was filed by the American Civil Liberties Union and the League of Women Voters. During the 2014 elections, while both the state and federal cases were still pending, Kobach’s office conducted a “dual” election system in which people who had registered to vote and shown proof of citizenship using the state form were allowed to vote in all races, but people who used the federal form could only vote in federal races. Attorneys for the ACLU asked Theis in July 2014 to block Kobach from holding dual elections. But with state and federal primary elections only a month away, and with a related case still pending at that time before the 10th Circuit, Theis declined to step in. The 10th Circuit did not issue its decision, declining to force the EAC to provide revised federal forms, until Nov. 7 last year, three days after the general election. Meanwhile, a small number of people who’d registered using the federal form were only allowed to vote in federal races. However, if Judge Theis rules in the ACLU lawsuit that the state cannot operate a dual election system, that would open a door to negating the proof of citizenship law because voters could merely bypass it by registering to vote using the federal form. The dominant purpose of the Elections Clause, the historical record bears out, was to empower Congress to override state election rules … The Clause was also intended to act as a safeguard against manipulation of electoral rules by politicians and factions in the States to entrench themselves or place their interests over those of the electorate. ARIZONA STATE LEGISLATURE v. ARIZONA INDEPENDENT REDISTRICTING COMMISSION ET AL. slip opinion at 25-26. If and when the court rules on Kansas’ two-track system (and the decision is appealed, as it almost certainly will be) this argument about the role of the Elections Clause is likely to step to the foreground. In short, the argument about two-track and proof-of-citizenship isn’t over in Kansas – nor is it settled nationwide. After a week when the Court released a series of big and important decisions, its seemingly small action yesterday is also important in the world of election policy in 2016 and beyond. 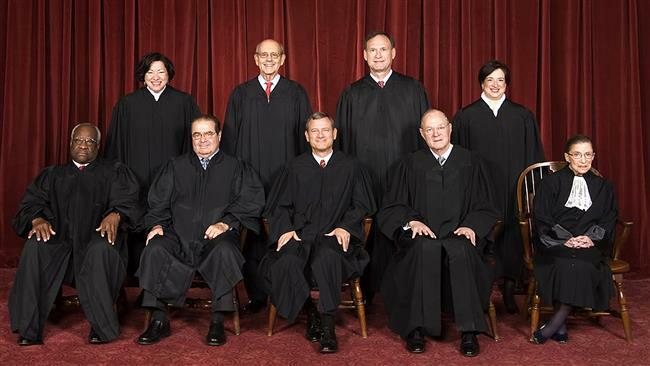 Be the first to comment on "Supreme Court Declines to Hear Proof-of-Citizenship Case"